Stuck in the Middle? Not so much. 4 Ways Middle School is Great in K-8 Schools. It’s the seventh grade trip. They’ve been outside all day long in the hot and sticky South Carolina sun. Early this morning they learned to surf for the first time. This afternoon they toured the salt marsh, watched dolphins feed, pulled crab traps, and felt glad to be human. Now these eight girls sit tightly around the kitchen table in a park cottage on a barrier island. It’s late; they have to be worn out, but they are arm in arm playing a game of spoons. Macy is braiding Kennedy’s hair while Aena and Leena laugh at a joke that Anna Kate just told them. Daphne is wiping down the counters after Caitlin finishes cooking quesadillas for a late night snack. Chase helps Ms. Mac find some some (appropriate) music, and soon all eight girls are singing at the top of their lungs, swaying in their seats, laughing hard at how bad their rendition must sound. 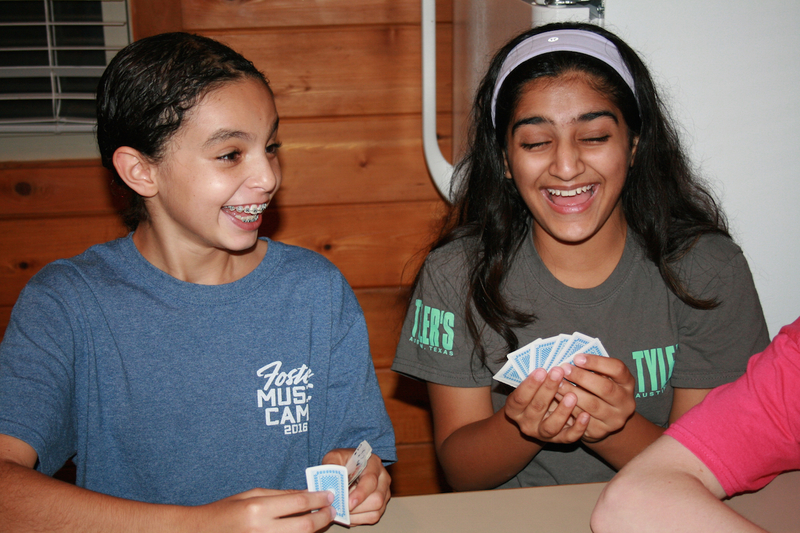 They sing in unison, live in peace, work as a team, play spoons as friends. They are seventh grade girls. But wait. Where’s the drama? Why aren’t they huddled up in small groups in separate rooms, plotting their next move? Middle school girls are supposed to scratch and claw at one another; they’re supposed to be mean, right? After all, there are copious reports of “mean girls” in middle school, mean boys too (bullies). Middle school is supposed to be awful. In fact, some research suggests getting rid of middle school altogether. We happen to agree, by the way, but not how you might think. The article “Sixth Grade is Tough; It Helps to be a ‘Top Dog’” , written by Anya Kamenetz, talks all about this. She does not recommend keeping teenagers home during middle school years; instead, she reports research that supports schools like The Lexington School, the K-8 model of education where middle schoolers feel like leaders (“Top Dogs”) rather than the “bottom dogs” of a K-12 (high school) or a detached middle school (public grades 6-8 only). READ THIS ARTICLE. It is worthwhile, and it proves what The Lexington School has known all along. We have our moments, but our kids are more comfortable. They feel safer. They learn to be kinder. Even their test scores are better. There’s plenty more, but while we are on the subject, let’s boil it down to 4 ways middle school in K-8 schools are great. 1. Students are the “TOP DOGS” (all three years). At K-8 schools, it all stops with Middle School. Middle schoolers are the leaders of the whole school. There is an inherent responsibility that comes with being the “big kid; they are role models and mentors for all the littles, school wide. That means they must be the “good big kids,” the kids the littles will want to be one day. 2. Students have a greater SENSE OF SELF. At K-8 independent schools, kids have a chance to be who they want to be without the pressure of “fitting in” to a high school environment they are destined to attend. Remember, K-8 kids have the luxury of choosing their next chapter. For that reason, even as new 6th graders merge into middle school for just three years (this happens a lot), they are pleasantly surprised to find an extra layer of acceptance they weren’t sure existed. They are welcome additions, accepted individuals. What a relief. 3. There is time to develop a PASSION. Allowing time for children to develop a passion is essential to deciding the next step—where to go to high school. At K-8 independent schools, children have consistent exposure to core curriculum as well as rich programming in physical fitness, athletics, visual and performing arts, modern language, and more. Without interruption, they have the luxury of time to know themselves, so when it’s time for that Freshman year, they have the knowledge of self to make the best decision on where to go next. These boys attended three different high schools. Like these boys, not all high schools are the same. High School Placement Fair helped them see their options. It’s open to the public too. 4. They are the FOCUS. High School Placement Counseling is just one example. This is a big deal at The Lexington School. We are not a feeder school for any one high school. In fact, Lexington School graduates, individuals that they are, attend high school programs all over Lexington and well beyond. Una MacCarthy, Assistant Head of School and director of high school placement counseling, says about the program: “Its one of my favorite duties. I get to sit with each 8th grade family and student and celebrate the person they have become over the years here at TLS and strategize which future school will continue that trajectory. No other school in town allows each kid to look at what high school program best matches his or her needs. There is no one default high school for our kids because no one of our kids are alike. We don’t try to make a child fit a particular school; rather choose a school to fit the child.” Even open to the public, High School Fair is one of the many services The Lexington School provides for middle schoolers as they learn their options for their next chapter. Being the “top dog,” feeling safe, finding a passion, and customizing the experience based on an awareness of each individual child…these are just four reasons why middle school can be great at K-8 independent schools.